Medical facials and chemical peels remove the top layer of the skin revealing a new fresh layer which gives the skin a brighter and rejuvenated appearance. They have anti-inflammatory and anti-bacterial properties. What peels do we use? We use alpha hydroxy acids and salicylic acid which are superficial and medium depth peels. We would have seen you for an initial consultation prior to your treatment appointment where you can discuss your concerns, a medical history is taken, any medication or contraindications to treatment are identified. 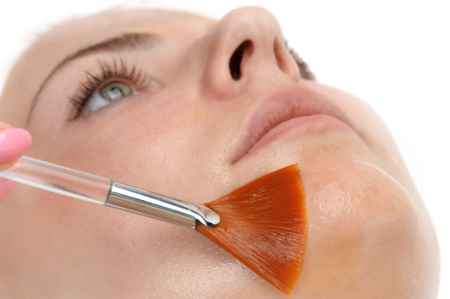 A skin analysis will then be made and we will tailor a treatment plan for you. The skin will be cleaned first and we recommend attending for your appointment without makeup. The peel will then placed on and removed carefully. We will put some cream with sun protection after the treatment has been completed. This treatment is suitable for the face, back and chest areas. When using superficial peels the skin feels tight and pick for a few days after the treatment. If medium depth peels are used, the skin will feel like a like sunburn and can peel 3-4 days after the treatment. We will careful advise you on the aftercare required for each type of peel. We recommend treatment intervals of about 3-4 months depending on your skin condition. Please note that in case of acne treatment a course of 4 peels a few weeks apart will be required. The treatment plan will be discussed with you in detail at your consultation appointment.